This entry was posted on 20 April 2015 at 14:42 and is filed under bedroom tax, benefit cap, benefits, disability living allowance, employment support allowance, universal credit, welfare reform, work capability assessment. You can follow any responses to this entry through the RSS 2.0 feed. You can leave a response, or trackback from your own site. 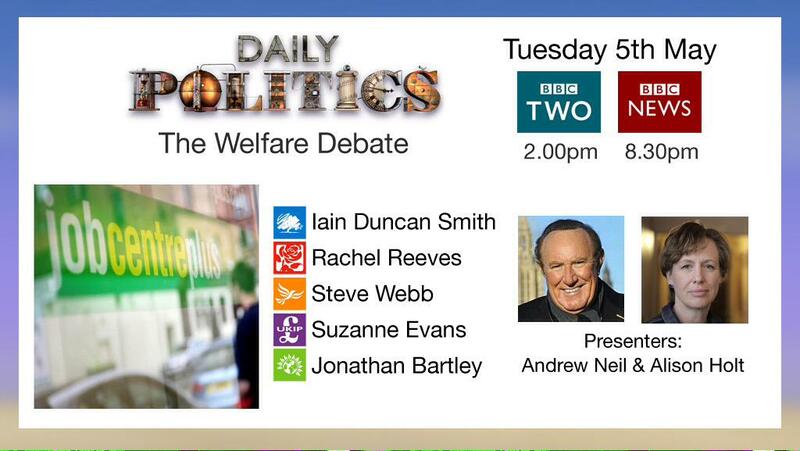 This welfare debate is between parties who all believe in the end of the welfare state by the austerity cuts to turn back to the nil welfare state of the 1930s. The Greens voted with the Tories in the one council The Greens rule, Brighton. The Greens ran away from policies that would have saved the poor from day in May. So something not worth watching. Parties getting total media blackout, yet could bring between them and the SNP and Plaid Cymru. 250 new, guaranteed anti austerity MPs into UK government. So as a group equal in number to either Tory or Labour MPS IN THE UK PARLIAMENT.